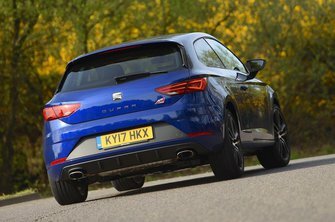 Seat Leon Cupra 300 Performance, Engine, Ride, Handling | What Car? Although it's no match for the comfort offered by the remarkably smooth-riding Volkswagen Golf R or Honda Civic Type R, compared with the stiff-riding Ford Focus RS the Leon Cupra 300 is perfectly passable for everyday use. Even given the huge 19in wheels it gets as standard, when you put the Leon Cupra's standard adaptive suspension to its softest mode it plucks the sting from most road scars. There's still a brittleness to the ride on really lumpy roads, though. Plus, select the firmer Sport and Cupra modes and, on anything less than a bowling green, the ride is way too bouncy. These are best left for a track day. The engine produces 296bhp, which sounds like plenty, but that’s less than most rivals, including the Golf R and the Civic Type R, and much less than the Focus RS. It still dominates the experience, mind, with even the slowest model – the ST estate with a manual gearbox – feeling effortlessly muscular across the rev range and getting you from 0-62mph in 6.0sec dead. The hatchbacks go slightly quicker, especially when fitted with the dual-clutch automatic gearbox that drops the 0-62mph time to 5.7sec. Or, if you opt for four-wheel drive (something you can do only on the estate model fitted with an auto 'box), the extra traction off the line will really pin you back into your seat as you’re launched to 62mph in just 4.9sec. 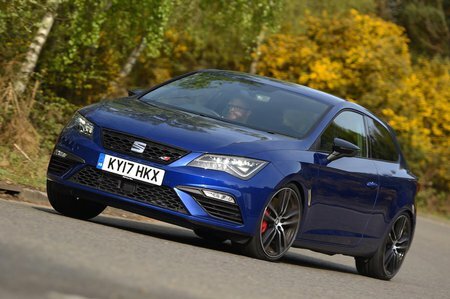 Given that most Leon Cupras send all their power to the front wheels, though, it's a good thing that Seat fits these with a limited-slip differential as standard. It's there to help stop the front wheels spinning when pulling away quickly from a standstill or accelerating out of corners. Yet, while it works up to a point, it’s nowhere near as effective as the diff found in the more aggressive Civic Type R and, as a result, the Leon simply cannot get its power down anywhere near as effectively. The four-wheel-drive ST gets round this, with plenty of traction even in slippery conditions. You can opt for sticky Michelin tyres to improve grip in the dry, but these are more suited to track use than the road, because they can actually reduce grip on really cold or wet surfaces. And ultimately, with or without its grippy, track-day tyres, the Leon just isn't as capable through corners as most of its rivals, most notably the stunningly good Civic Type R, but also the Focus RS and even the cheaper Hyundai i30N. In fact, in most respects we'd describe the Leon Cupra as effective rather than a purist's delight. The steering is consistent but never offers quite the precision of the Civic Type R's, and the Leon Cupra fails to serve up the agility provided by that car, either. It even sounds a bit flat, with its enhanced exhaust note played through the speakers in Cupra mode. In this respect, it’s more akin to the Golf R; so for something rather more rousing, try the Focus RS or BMW M140i instead. The standard brakes are up to the job, though, stopping the Leon Cupra 300 very effectively. But for anyone using the car on track, there’s the optional Performance Package. This adds bigger discs and four-pot Brembo calipers that, even under heavy use, resist fade well. Both the manual and automatic gearboxes have six speeds and work well. The former has a slick shift and adds a bit more driver involvement to the experience, so if your commute doesn’t involve constant traffic jams it’s the one we’d choose. If not, the auto is able to rattle off exceedingly rapid shifts one minute and be smooth and gentle the next. As well as the performance advantages we’ve mentioned, it also improves fuel economy.